James Robert Hogg was born on 23 November 1934 in Annapolis, MD. He graduated from the U.S. Naval Academy and was commissioned as an Ensign in the Navy in June 1956. His sea commands included a Guided Missile Cruiser, two Destroyer Squadrons, and a Cruiser-Destroyer Flotilla. He commanded the U.S. Seventh Fleet from May 1983 to March 1985. His Staff service included assignment as Executive Assistant to the Chief of Naval Personnel, Director of Military Personnel Policy, and Director of Naval Warfare working in the areas of Military Requirements and Acquisition. 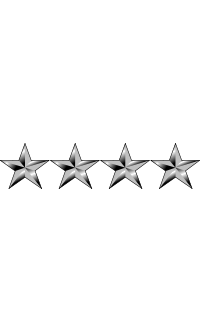 On 1 December 1988, Hogg was promoted to the four-star rank of Admiral and assigned as U.S. Military Representative, NATO Military Committee (USMILREP). Admiral Hogg retired from the Navy in May 1991. In addition to the U.S. Naval Academy, Hogg is a graduate of the U.S. Air Force Air Command and Staff College and holds a degree of Master of Science in Business Administration at George Washington University. 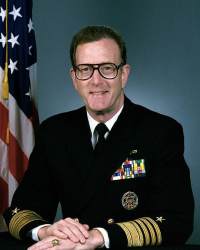 Recipient of the Vice Admiral Charles E. Weakley Award (1989). Recipient of the Betsy Ross Freedom Award (1991). Recipient of the Roland M. Teel Award (1995). He is the Director of the Chief of Naval Operations Strategic Studies Group, assuming the position in July 1995. He also served for four years as President of the National Security Industrial Association, a major national defense industry association of some 400 companies of all sizes from all segments of industry that relate to U.S. national security.